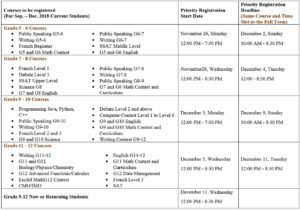 The winter semester (Jan. – Jun. 2019) timetable has been posted on our website. The fall semester will end on Sunday, December 23. The winter semester will begin on Tuesday, January 8. Current students who would like to continue their classes during the next semester will have registration priority. 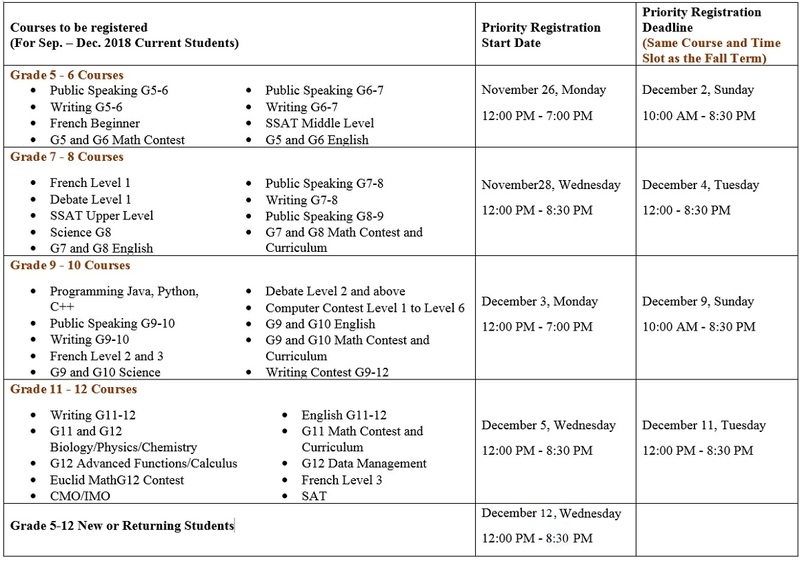 We have assigned specific time periods (see the table below), during which only current Olympiads students can register. After that period, new students may register. To avoid crowdedness at the front desk, priority registration periods are staggered based on grade of the registration courses. Registrations are on a first-come, first-served basis. Families with two or more children (all current students) from different grades may register for all children during the first Priority Registration Period. Parents must take a tracking number: one number per parent. Parents may not obtain another number on another parent’s behalf. The tracking number is only valid for that day. During the registration period, academic counselling support will be offered by our school’s trained associates. Unfortunately, our front desk secretaries will not be answering academic-related questions. There are three semesters in an academic year: winter (January to June), summer (July to August), and fall (September to December). Each semester’s tuition must be paid in full before the semester starts. Accepted payments are debit card, cheque, and cash. Note: For parents who want to make the payment by debit, please check the limit before registration to ensure efficiency.